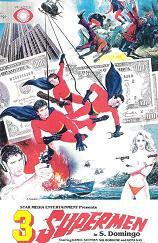 In the last installment of the popular 3 Fantastic Supermen series, our red-suited crime fighters travel to South America to battle a gang of counterfeiters. With plenty of outrageous fighting and stunts. Stars Daniel Stephen, Sal Borgese, Stefano Martinenghi and Gena Gas.